Share Market on Monday: ICICI Bank, SBI, Infosys, ITC and Reliance Industries contributed the most to the gains in the 30-share Sensex pack. Share Market on Monday: The Nifty hit the crucial 11,400 mark for the first time ever. The share market hit fresh highs in early trade on Monday. The Sensex opened at 37,714.70 and hit an intraday high of 37,805.25 while the Nifty50 started at 11,401.50 and hit a record of 11,427.65. The broader Nifty50 index went past the crucial 11,400 mark for the first time ever. At 10:45 am, the Sensex traded at 37,719.43 with a gain of 163.27 points or 0.43 per cent. The Nifty traded at 11,401.95, up 41.15 points or 0.36 per cent. 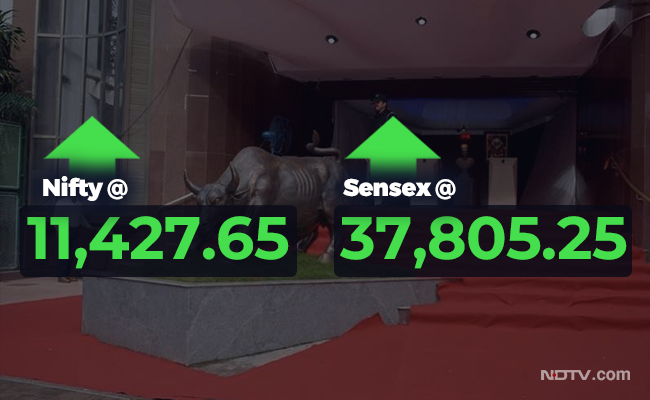 At 9:39 am, State Bank of India (up 2.70 per cent), ICICI Bank (up 2.46 per cent),Vedanta (up 1.40 per cent), YES Bank(up 1.22 per cent), and Tata Steel (up 1.15 per cent) were the top Sensex gainers. UPL (up 2.32 per cent), SBI (up 2.31 per cent), ICICI Bank (up 2.20 per cent), Axis Bank (up 1.34 per cent) and Tata Steel (up 1.31 per cent) were the top five Nifty gainers. Forty-four out of 50 Nifty stocks advanced in trade. ICICI Bank, SBI, Infosys, ITC and Reliance Industries contributed the most to the gains in the 30-share Sensex pack. The BSE Midcap index gained 0.62 per cent and the Smallcap index was up 0.85 per cent, thus outperforming the benchmark Sensex. All sectoral indices of the National Stock Exchange (NSE) traded in the green led by the Nifty PSU Bank index which gained 2.04 per cent. Ritesh Ashar, Chief Strategy Officer, KIFS Trade Capital said, "Going forward, the focus will remain on news associated with the trade war. Stock specific moves are expected and Nifty will probably continue to move towards north retesting the earlier highs." Stocks across Asia advanced as China's efforts to stop sharp declines in its currency and capital flight supported wider sentiment in the region, although the escalating Sino-US trade conflict has capped gains, according to a report by news agency Reuters. Late on Friday, the People's Bank of China raised the reserve requirement on some foreign exchange forward positions, making it more expensive to bet against the Chinese currency and helping pull the yuan away from 14-month lows. Chinese shares were positive, with the blue-chip share index up 0.5 per cent. Hong Kong's Hang Seng index gained 1.3 per cent. MSCI's broadest index of Asia-Pacific shares outside Japan leapt 0.9 per cent - the biggest jump in a month and its second straight session of gains. Japan's Nikkei edged up 0.4 per cent, while Australian shares added 0.75 per cent.